Shuck and Jive: Pick Your Spirituality! 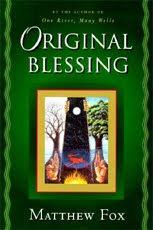 In preparation for my sermons this year on the four paths of Creation Spirituality (we are now on via creativa), I have been re-reading Matthew Fox's Original Blessing. One thing I like about Matthew Fox is his ability to make fun charts. With a handy chart, Fox compares the popular Fall/Redemption model of spirituality with the Creation-Centered model of spirituality. This is his appendix B from Original Blessing. In the book of course, it is in a side by side chart. I had to reproduce it the following way. Do know, beloveds, that the Fall/Redemption types were not amused by Fox's chart-making and had him reported. 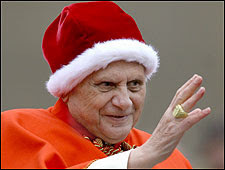 He was later excommunicated from the Catholic Church by Cardinal Ratzinger the very same who was promoted to Pope. Fall-Redemption types are ruthless and calculating. However, the good shall prevail. Choose your favorite Christmas color--red or green to match your spirituality! I thought the seasonal color for Christmas was white. Did I get my stoles mixed up? :) Red is for Pentecost and Green is for "ordinary days." Except I don't believe there are any ordinary days. Back when I was young, lo these many years ago Presbyterians didn't go in for seasonal colors. It was scarlet all the time on the pulpit and the lectern. And the pastor didn't wear any stole. As to your dualisms (had to get that in) it seems to me that many if not most are both and not either or. I always say I'm a "both-and" person in an "either-or" world. but then I'm a heretic. It seems to me that atonement theory by itself (or any other theory of Christ's work) is insufficient. The Bible uses a variety of images to talk about the work of Christ: redemption, which may or may not be atonement, reconciliation, taught by Christ's teaching and life on how to live as people of the Kingdom, defeat of the principalities and powers, etc. All the images are necessary to talk about the fullness of the work of Christ.